Located in the American West, Desert Southwest and Mountain West regions of the U.S., Nevada is a true gem as a mountain biking locale—a place with a variety of different trains to suit all styles of riding. By total area, Nevada is America’s seventh-largest state, but with a population that ranks 35th nationally, it is also the 9th least densely populated state in the country—a place where, with the exception of Clark County, which holds roughly three-quarters of the state’s population, has a lot of room to spread your wings and ride. Nevada is dominated by desert land and a semiarid climate, and much of the state is located within the Great Basin. Areas south of the Great Basin are located within the Mojave Desert, while Lake Tahoe and the Sierra Nevada Mountain ranges lie on the western edge of the state. About 86% of the state’s land is managed by various jurisdictions of the U.S. federal government, both civilian and military. Nevada is best known as being the home of Las Vegas, a gambling and entertaining Mecca with bright lights, glitz and lots of money changing hands 24 hours a day. However, once you get out of the Las Vegas area and go beyond the Clark County limits, the state literally opens up with various desert, mountain and prairie-like terrains with an abundance of great mountain biking trails designed for riders of all ages and ability levels: beginner, novice, advanced and expert riders. 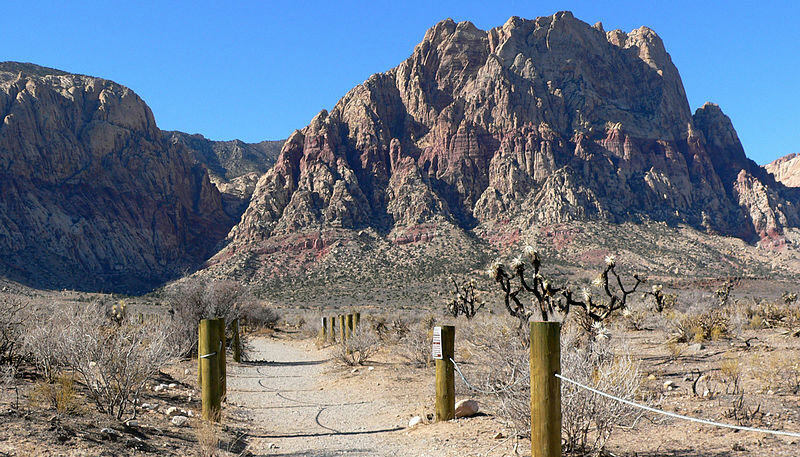 To illustrate this point, below we have highlighted five of Nevada’s most well-loved and popular trails, located in various areas of the state. We have also included a brief description of each trail as a way to showcase their collective characteristics, difficulty rating and much more. The Peavine Mountain trail system is one of the most predominant geographical features of the Reno and Sparks region of Nevada. The various trails at Peavine Mountain are located in Washoe County, at the northwest corner of the Truckee Meadows and about four miles due east of the California state line. Because of its prime location, the Peavine Mountain trail system is very popular among both locals and out-of-town mountain biking enthusiasts—a locale that offers more than 20 miles of off road track that is perfect for riders of all ages and ability levels, ranging from novices to expert and competitive cyclists. Moreover, its proximity to the city center affords local riders the opportunity to ride during the week after work. Peavine Mountain’s unique and varied geography makes some portions of the course very challenging, as riders will need to negotiate an array of obstacles, including rock gardens, banked turns, bridges, jumps and a very grueling climb to the top of the trail, an area known as Peavine Peak. This is followed by a very rapid and hair-raising descent that steers riders through some of the most beautiful local flora of the American Mountain West. The trail system at Peavine Mountain is maintained by representatives of the Humboldt-Toiyobe National Forest, a group that has consistently added many miles of hiking and mountain biking trails to the region over the years. Located in the town of Carson City—the state capital of Nevada—the Clear Creek Canyon Trail is rated intermediate in terms of its level of difficulty. Comprised entirely of twisting and flowing single track, the Clear Creek Canyon Trail spans approximately 10 miles in length, but most riders choose to tackle the course as an out-and-back loop measuring a total of 20 miles. The Clear Creek Canyon Trail commences at the local elementary school (Jacks Valley Elementary) at the Jacks Valley trailhead and concludes roughly 1,000 feet southwest of the Highway 50/Tahoe Gold Club Drive interchange. The trail climbs gradually from the onset, and descends fairly rapidly at a pleasing 5 percent grade. These up and down sections are mixed with several flat portions along the course, areas that are simply perfect for coasting and resting up for the next big ascent. The elevation of the Clear Creek Canyon Trail ranges between 5,000 feet above sea level at the Jacks Valley Trailhead and roughly 6,300 feet near the top of the course, at the south fork crossing of Clear Creek. In addition to the Jacks Valley Trailhead, there is also an alternate starting point for this course, located just a half mile to the west, where the trail crosses the paved section of road. Overall, this is a great course for novice and intermediate riders looking for an adventurous test, and a superb track for more advanced to expert riders seeking to master certain tricks and skills. Recreational riders and family groups will simply adore the beginner-rated Flume Trail, a 14-mile loop course located in the small town of Incline Village, Nevada. Located very near Carson City, Nevada, the Flume Trail is an enjoyable, predominantly flat single track course that twists its way along a precipitous mountain side, while dropping only about 40 feet per minute. Because of its very high locale, approximately 7,900 feet above sea level, riders who have even the slightest fear of heights may want to skip this ride. Others, however, will enjoy a very scenic ride that has gained in popularity every year since its inception. Although the Flume Trail does not include many of the typical obstacles consistently seen on more advanced tracks, riders will still need to negotiate a fair share of rocks, roots and fairly tight switchbacks. There is one very brief portion of the course marked as a “rock slide area,” and cyclists are advised to walk their bikes over this area. Access to the Flume Trail can be gained via the North Canyon Road at Spooner Lake State Park or at the Tahoe Rim Trail located in the meadows of the same name. The Bootleg Canyon Trail is one of the longest and most technical trails in the state of Nevada—an intermediate-rated course located in the beautiful town of Boulder City. Measuring some 35 miles in total distance, with a modest elevation gain of 650 feet, the trail is one of the best single track routes the state has to offer. Dubbed an “Epic Ride” by the International Mountain Biking Association (IMBA), the Bootleg Canyon trail system features a series of often grueling climbs; rapid, flowing and twisty descents; and a number of natural and manmade obstacles, including large roots, rock gardens, soft, gravelly sand, jumps, bridges and several creek crossings. In addition to the exciting ride cyclists will find at Bootleg Canyon, there is also some amazing scenery, with spots overlooking the vast Nevada desert that can make riders feel as if they have traveled to another time and dimension. In its entirety, the trail system at Bootleg Canyon offers courses for every level of rider. Whether you’re looking for an easy, family-friendly ride that is virtually flat in nature, or a technical, rock-laden course to test the limits of your bike handling skills, the Bootleg Canyon system of trails has exactly what you are looking for. Situated in the town of Genoa, Nevada, the Sierra Canyon Trail has rapidly become one of the more popular routes in the state, entertaining riders across the ability spectrum. Riders who opt to challenge this enticing, 10-mile, expert-rated (black diamond) course will experience an up and down adventure like no other, on a trail that sits just under 5,000 feet above sea level. Characterized by a challenging, switchback-aided climb and a descent that feels more like a roller coaster than a mountain biking trail, the Sierra Canyon Trail can really test a rider’s gumption and nerve. Throughout the middle portions of the Sierra Canyon Trail, riders are forced to wind their way through a series of very tough obstacles, including berms, skinnies, jumps, rocks, roots, drop-offs and even a couple of manmade bridges. Scenically, the Sierra Canyon Trail—and the Genoa wilderness that surrounds it—offers some of the most majestic views the state of Nevada has to offer. A quiet, canopy of trees provides lots of shade for this course (a bonus during the late summer), and the adjacent fields of wildflowers, particularly during the spring and early summer months, burst with all the vivid color of the rainbow, often in front of a snowcapped backdrop that is still glistening with the last signs of winter.